JULIAN STATION: Of Daffodils, Candied Nuts and Fine Spirits! Of Daffodils, Candied Nuts and Fine Spirits! This week at Wynola Farms Marketplace we have some Sweet News from La Spice - The Walnut Company. They are introducing their newest nut--"Natural Spice Walnuts"--at this weeks Julian Certified Farmers' Market. This great snack is Sugar Free--made with 100% natural sweeteners! Come and try all their amazing nut samples. You can also visit them at http://www.thewalnutco.com/. "A simple nut turned into an extraordinary snack!" The Farmers' Market also has a new salsa vendor, in addition to live music from High Wire! Hope to see you there. For info and directions go to http://www.wynolafarms.com/. The Daffodil Show is coming to Julian--March 20 & 21st. The Daffodil Show keeps growing and has been moved! This year it will be held upstairs in the Julian Town Hall from 12:00 noon to 5:00 pm each day. 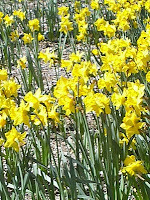 Daffodil names and questions about daffodils will be answered by National Daffodil experts. There was a nice review of Wynola Farms Marketplace's 3 Julian tasting rooms--wine, beer & hard cider--in The Wine Buzzzz's blog this week. Check it out at: http://thewinebuzzzz.com/?cat=7.